It’s been awhile since I created a new low carb cauliflower side dish recipe, and I have to say that this new faux risotto recipe is not only delicious, but also super easy – which is definitely a win win situation. If you’ve ever made “real” risotto then you know how long it takes and how labor intensive it is, what with all of that tedious stirring and adding liquid every few minutes. Not so with this low carb cauliflower version! I’m not convinced that the cauliflower “crumbles” are worth the extra cost, but it really depends on how much time you have on your hands – or how much you hate chopping and prepping. 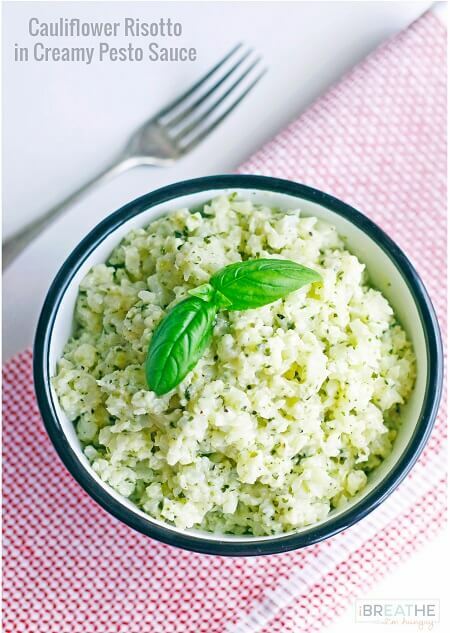 Loaded with cheesy pesto flavor, this cauliflower “risotto” recipe a has a lovely creamy texture from the Mascarpone cheese that mimics the silky, clingy texture of a true risotto – without all of the starch and carbs. 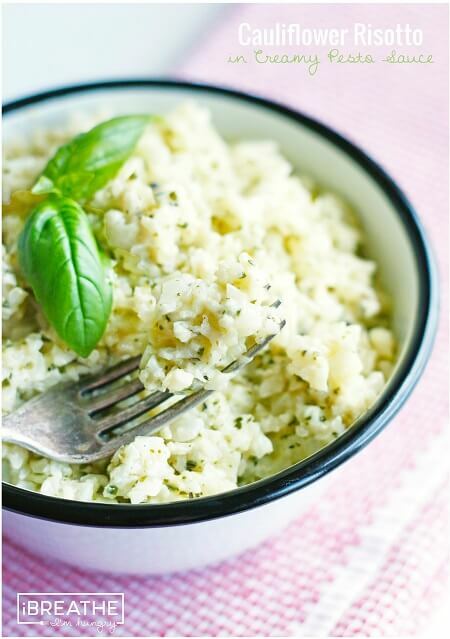 You can cook the cauliflower “rice” to your liking – I left mine a little firmer for an al-dente texture in this recipe, but if you like it really soft then that would be delicious also. I used a store-bought pesto for this because I didn’t have a lot of fresh basil to use up – but if you have a bumper crop of basil in your garden then you can easily make your own low carb pesto for this (or any) recipe that calls for it. 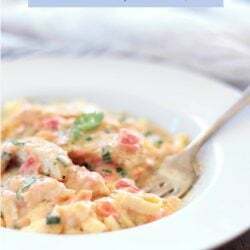 This is a truly versatile low carb recipe that can be easily made into a complete one pot meal with the addition of some chunks of cooked chicken. Add a little extra pesto and cheese – maybe even sprinkle some Parmesan over the top, and you can bake it for 10 minutes and turn it into a wonderful low carb casserole that even the kids will love! 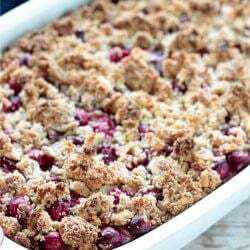 In fact I may experiment with a full on casserole version myself, and will post it if I do! If you beat me to it, let us know how it turned out in the comments! Meanwhile, if you’re looking for more delicious low carb cauliflower casserole recipes, try my kid-friendly Low Carb Jalapeno Popper Cauliflower Casserole and/or the wildly popular Low Carb Pepperoni Pizza Cauliflower Casserole recipes! 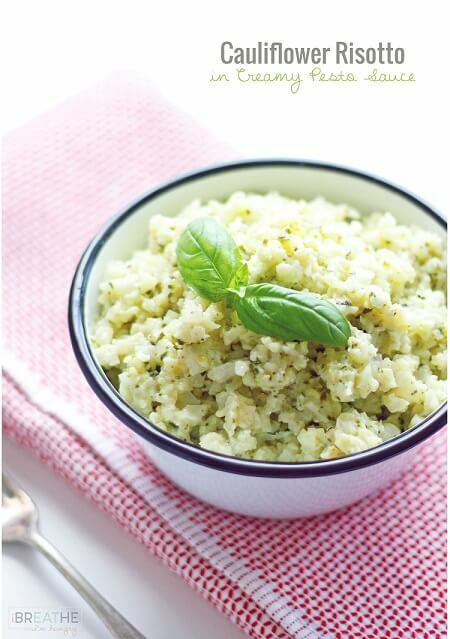 This versatile low carb side dish recipe perfectly mimics a classic risotto but is made with cauliflower and smothered in a cheesy pesto sauce. Keto and Atkins friendly. Combine the cauliflower, butter, salt, pepper, and garlic powder in a microwave safe bowl. Microwave on high for six minutes – or until the cauliflower is tender and done to your liking. Add the mascarpone cheese and microwave on high for 2 more minutes. Stir in the basil pesto and serve warm. To get more great recipes for Summer or anytime, download my super bundle of FIVE e-books for just $19.99! A keeper!!!!!!!!!! Especially easy and fast with my new food processor!!! So glad I found your website! 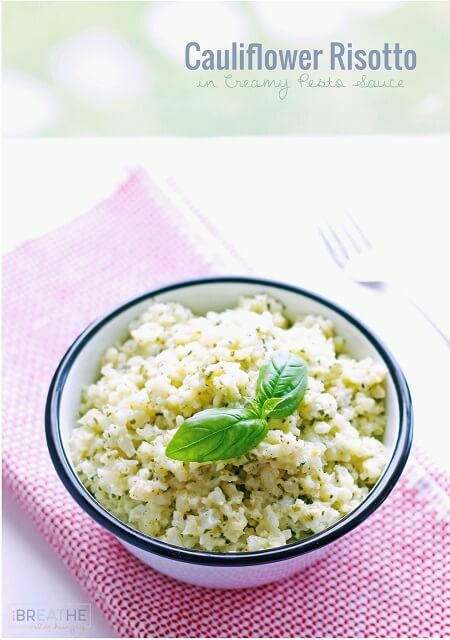 This cauliflower risotto is delicious. My meat and potato guy couldn’t believe it was cauliflower. I served it with shrimp piccata. Yummy! 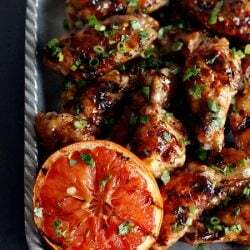 This is a great recipe, it turned out really well! I had microwaveable cauliflower rice (Caulirice) so I skipped the first step and just added the butter and mascarpone to the rice and cooked it for 2 mins in the microwave then added the pesto once cooled. I had it with mussels in garlic butter – just as good as real risotto! OMG this was freaking AMAZING! 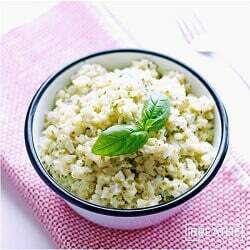 I have adopted a few of your LC recipes in the past, so when I did a Google search on “pesto, Caulirice” was happy to see yours. 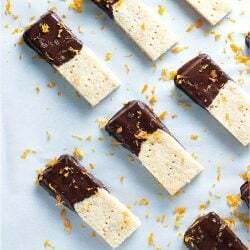 The Mascarpone addition is brilliant! I used a touch more pesto, and cooked everything on my gas stove, in a wok. Topped the pesto risotto bowls with fresh Parm, and flash grilled shrimp, in lemon, EVOO and butter. Yummmmo! Thanks for a quick, delish recipe. Complete meal start to finish, 15 minutes. You rock! What a great side dish!! 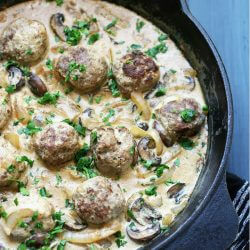 Just getting back to a low carb diet and this was absolutely delicious and really easy to make. Will make this one again. Just found your site at midnight because the baby woke me up. I’m a vegetarian (no eggs but having dairy) on a low-carb diet per doctor’s orders! 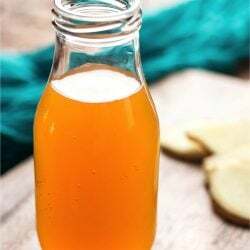 Loving your recipes and site! This looks like an absolute winner. My son loves pesto and mascarpone. We’ll see what he says about the cauliflower. Will try this with broccoli too. Wow!! This is amazing! I’m going to try it with some neon cheese powder next time my kids are having mac and cheese! I am consuming this AS I WRITE, and I’m surprised I managed to put my fork down long enough to pick up my tablet. This is insanely delicious. I made fresh pesto (and grilled some chicken with extra pesto smeared on). I didn’t have pine nuts so I used walnuts and then toasted some extra walnuts and added them to the finished risotto for a little crunch. SO YUMMMMMM! 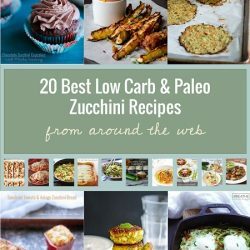 I’ve been low carb since January and this was the first site I started using for recipes. Sorry it’s taken me so long to comment. I love your site! And I’ll make this risotto one hundreds more times!!! As chicken + pesto + sundried tomatoes is probably the best combo in the Universe, I wanna try this next to your feta cheese and sundried tomatoes meatballs (I already have few batches in my freezer). I made this last night and it was delicious. Even my daughter’s boyfriend who is not a cauliflower fan loved it. No leftovers. I have enjoyed many of your recipes. Thank you. It’s a new product that’s out lately where they sell the cauliflower in bags already chopped into fine pieces to use as rice or in other low carb applications. I think Trader Joe’s has them and some other high end stores. If you can find them it will definitely save you a few minutes, but it’s probably twice as much cost-wise as regular cauliflower. This looks so good. But I don’t have a microwave. When I make your cauliflower chorizo mac & cheese, I boil the cauliflower and it turns out pretty good. But I’m wondering if you have any alternate suggestions? You can steam the cauliflower or boil it, then drain it well and add the other ingredients and it should come out just fine! Enjoy! 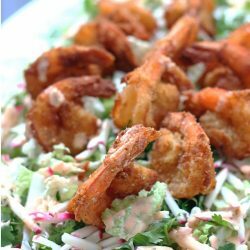 I think I will add shrimp to make a complete meal.